Obtaining the proper medical care can be difficult due to logistical and financial burdens facing those in underserved communities. By pairing multiple services within your mobile medical vehicle, you can have a larger impact on those who would otherwise go without these vital services. Mobile medical clinics can schedule times with schools to provide healthcare tailored to children with little impact on their school day. These vehicles can offer many services growing children need such as dental, vision, hearing screenings, and even behavioral care from the same platform. This same concept can be utilized by businesses as well. 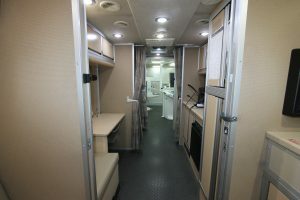 Employers can schedule the vehicle to conduct medical services at their business such as routine screenings and immunizations without their employees ever having to leave the office. Not only does this mean no travel for the employee, but also less of an impact on productivity for the business. Telehealth is another way to provide services to those who utilize a mobile medical vehicle for healthcare. This service allows doctors to teleconference-in and speak with patients as if it were a traditional appointment. During the telehealth consultation, the doctor can have the on-site staff perform additional tests or other needed services. Telemedicine ensures doctors can serve patients they may not have seen while patients can obtain the medical attention they need. The ability to offer multiple medical services out of the same platform can also help you obtain funding for your medical vehicle. Consolidating into one platform saves your organization from having to purchase more vehicles to provide multiple services. Fewer vehicles means a reduction in your maintenance and staffing costs. When choosing your platform, keep in mind that the size dictates who can actually drive your mobile medical vehicle. Electing to use a smaller platform allows your own employees to operate the vehicle, eradicating the need for a specially-licensed driver. Staff members could feasibly drive to appointment locations and begin set-up and check-in procedures once they are parked, saving your organization time on-site as well. For those living in underserved communities, attending multiple appointments at different doctors isn’t feasible, even if it is necessary to their health. 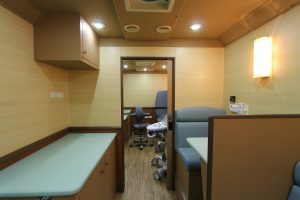 Having the flexibility to offer multiple services from your mobile medical vehicle can greatly affect the well-being of individuals living in these areas.